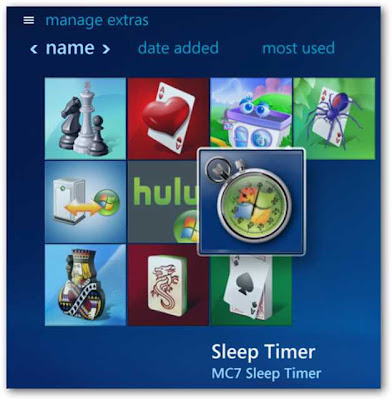 Do you make it a habit of falling asleep at night while watching Windows Media Center? 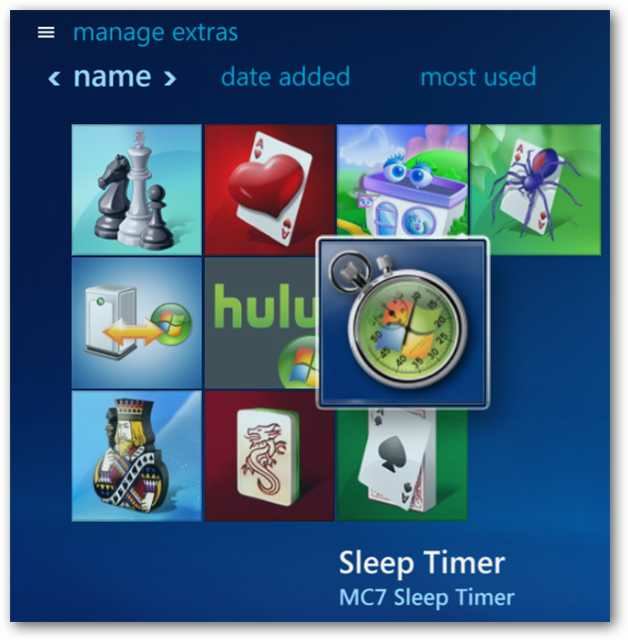 Today we are going to take a look at the MC7 Sleep Timer for Windows 7 Media Center. This simple little plugin allows you to schedule an automatic shutdown time in Media Center. 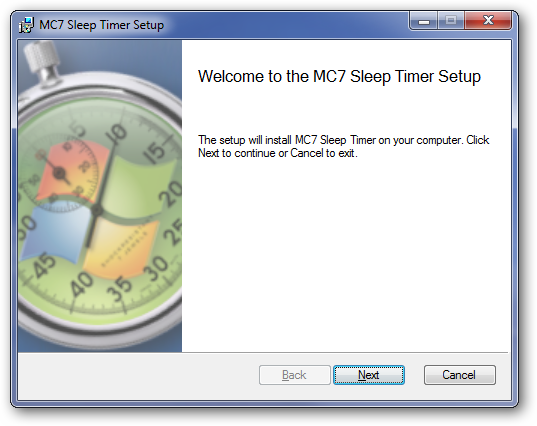 Note: At this point MC7 Sleep Timer doesn’t work with extenders. If you’re using ClamAV or Panda it may detect this plugin as a virus, we’ve tested it and this is a false positive for these two antivirus apps. 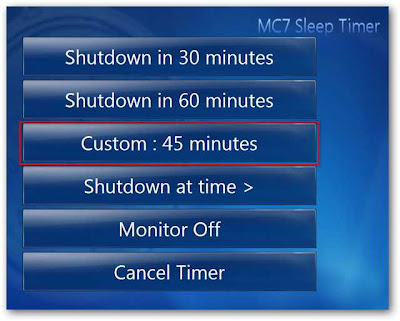 After the installation is finished, you will find MC7 Sleep Timer located in the Media Center Extras Library. Click on the tile to open the timer and configure your settings. 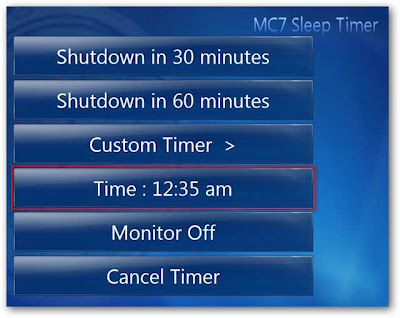 The MC7 Sleep Timer will open in full screen mode. 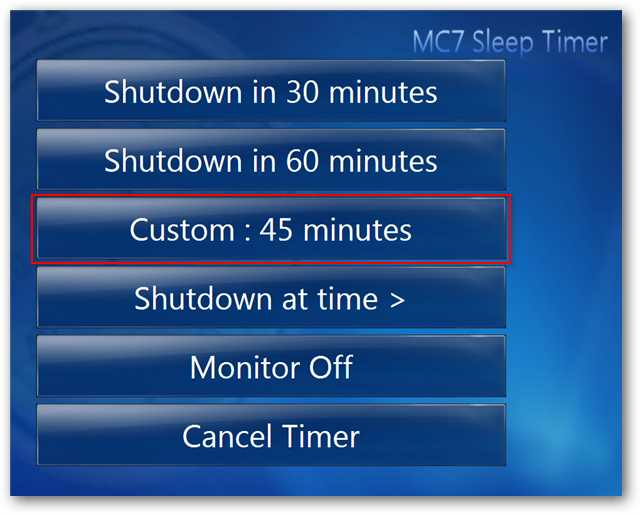 You can choose to shutdown the PC after 30 or 60 minutes, create a custom length shutdown timer at any 5 minute interval, or select the exact time you want the PC to shutdown. After setting your PC to shutdown, you’ll get an audio confirmation. To set a custom timer length, scroll to the “Custom timer” option and click right or left on your Media Center remote or, the right or left arrow keys, to choose how many minutes before shutdown. To schedule a shutdown for a certain time, browse to the “Shutdown at time” button, and scroll right or left with the arrow keys on the keyboard or remote. When you’ve chosen your time, hit “Enter” on the keyboard or “OK” on the remote. Clicking the “Monitor Off” button will turn off only the monitor and “Cancel Timer” will cancel your shutdown request. 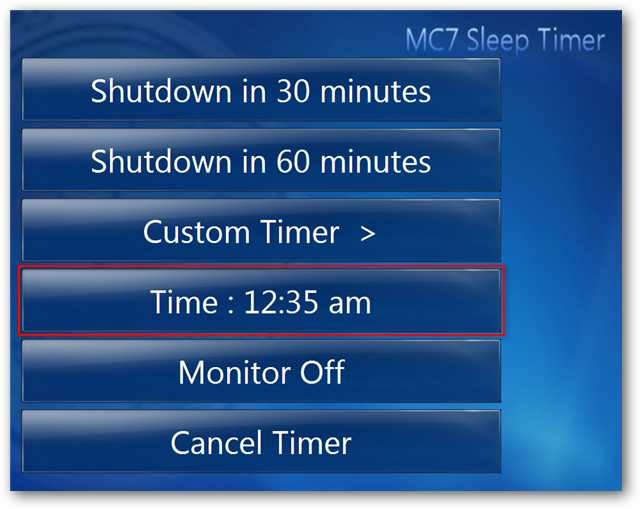 If you often find yourself falling asleep every night watching Media Center and then fumbling and stumbling in the middle of the night to shutdown your computer, MC7 Sleep timer might just be a perfect addition to your Media Center setup.